We love the Asian Fish Fillets in the Everyday Cookbook. It’s a simple, healthy dinner that requires minimal preparation. For us, it is our alternative to take-away….. just as quick, a whole lot healthier and, in my opinion, tastier than most take away meals. This dish is the Italian version. 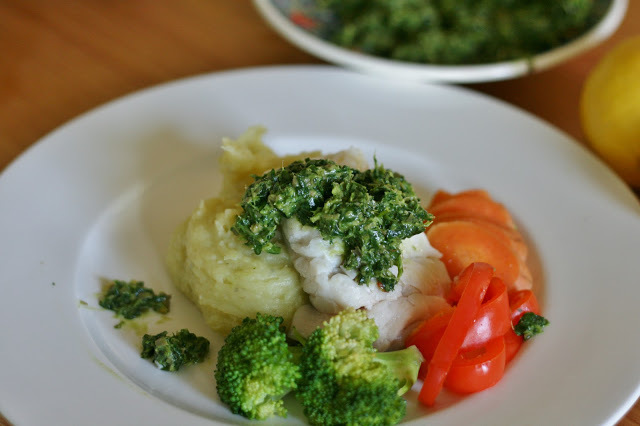 Served with Salsa Verde, a pesto-like dressing and accompanied by mashed potato and steamed vegetables. Salsa Verde is made with a mixture of herbs as well as anchovies, capers and lemon. These piquant flavours make it a beautiful accompaniment to seafood, roast meats and many other savoury dishes. It would be wonderful tossed through some steamed potatoes or a chickpea salad with roasted capsicum. The Thermomix is perfect for making a Salsa Verde and those patented blades makes sure that it retains the beautiful vibrant green colour. Once you have made your Salsa Verde, the rest of the meal is all cooked together at the same time….super simple, just how I love it! Start by making the Salsa Verde. Add mustard and lemon juice and combine on Speed 4. Whilst blades are still turning add the oil slowly. Scrape down the bowl and process a little bit more if needed. Set sauce aside and without washing, place water into to the mixing bowl. Insert steaming basket and put potatoes inside. Cook 15 mins/Varoma/Speed 1. Whilst this is coming to temperature, arrange vegetable into Varoma bowl and place fish skin side down onto the Varoma tray. Immediately, place Varoma on to TM lid to steam. Check fish and vegetables after the 15 minutes and remove if necessary. Cook potatoes a further 5 mins/Varoma/Sp 1. When cooked, remove basket and empty the water. Add butterfly to TM bowl with potatoes and oil and puree 30 secs.Sp4. Serve potatoes, vegetables and fish and drizzle salsa verde on the top. Just found this lovely blog. Thanks for the wonderful recipes. I will try this recipe. The pictures are also very appealing. Tummy rumbling experience! What sort of mustard do you use for the Green sauce? I made this last night and it was fantastic – thanks Tamara. I always use French mustard for cooking. I reserve my lovely grainy mustard for steaks!